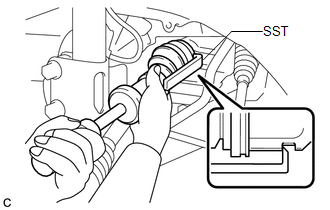 (a) Using SST and a hammer, release the staked part of the front axle shaft nut. 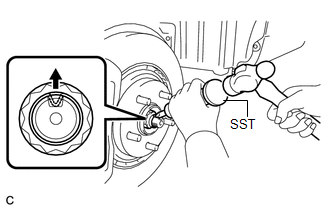 (b) While applying the brakes, remove the front axle shaft nut. 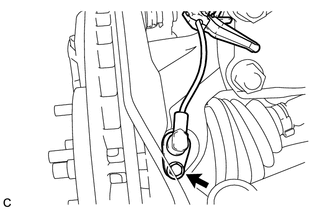 (a) Remove the bolt and separate the front speed sensor from the steering knuckle. 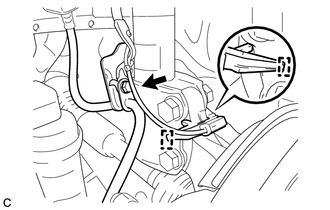 (b) Remove the bolt and clamp, and separate the front speed sensor and front flexible hose. 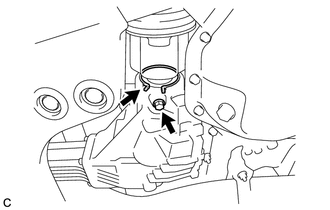 (a) Using SST, remove the front drive shaft assembly LH. Be careful not to drop the drive shaft assembly. (a) Remove the bearing bracket hole snap ring from the drive shaft bearing bracket. 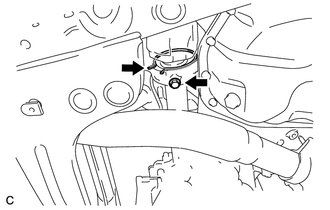 (b) Remove the bolt and front drive shaft assembly RH from the drive shaft bearing bracket.